In 1907, a group of business from Vancouver got together and formed the Vancouver Exhibition Association. They wanted to promote the industry and agriculture within the surrounding area, as well as providing a fun summer family event. Planning took three years, and the first fair began on August 15, 1910, and was opened by the Prime Minister at the time, Sir Wilfrid Laurier. The first fair was attended by 68,000 visitors over 17 days, and at the time was the second largest fair in North America, second to the New York State Fair. There were trade stalls from various industrial companies of the time, such as Singer Sewing Machines and the Electric Water Heater company. There was also a large entertainment aspect, named Skid Road, which included games, rides, and live entertainment such as dancers and comedians. Gambling and horse racing also took place. 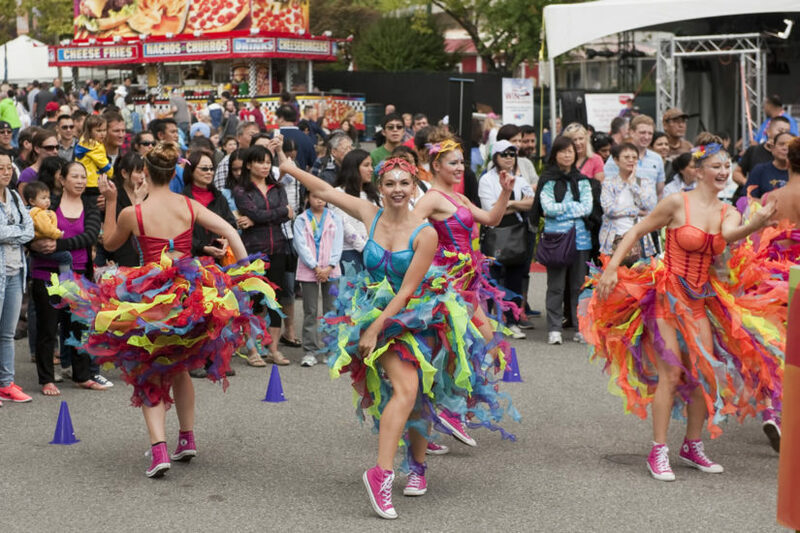 This eclectic mix of exhibition and entertainment attracted people in Vancouver from all walks of life, and the first fair was a great success. 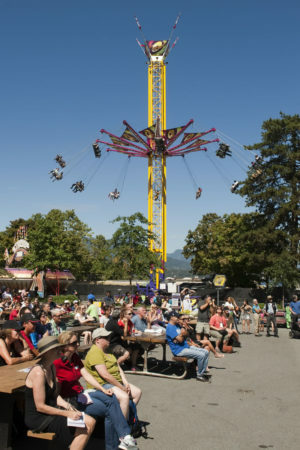 The PNE fair has been held at Hastings Park in Vancouver every year since it began in 1910. The park is in the northeastern corner of the city, and the fair encouraged development in that direction to expand the city. The 162-acre Hastings Park is managed by the PNE and is home to the now permanent amusement park called Playland. Playland is the center of the modern-day PNE fair and is home to one of the world’s best examples of a wooden rollercoaster structure. Built in 1958, the rollercoaster is still ridden today by around 500,000 visitors each year. Playland was founded in 1910 when the first PNE fair was held and has increased in size since then. In 1926 the amusement park was sufficiently developed to have its own identity within Hastings Park and was named Happy Land. In 1958 the amusement park moved location, the roller coaster was built, and it was renamed Playland. Hastings Park has been developed considerably over the years and is now a venue for horse racing, indoor sports at the Pacific Coliseum, concerts, and conventions. Many of the original buildings were knocked down during a restoration project which began in 1997 in order to return the park to its original purpose as a green space. Over the years the PNE fair has acquired an extensive and interesting history. The fair controversially remained open during the First World War, despite the Great Depression the fair’s attendance numbers almost doubled between the 1920s and the 1930s. Between 1942 and 1946 the fair was canceled due to the Second World War, and there was a lot of military activity at Hastings Park. Thousands of Japanese-Canadians were processed at the park on their way to internment camps, and the land was used by the military for drills and storage. Many innovations in technology debuted at the PNE over the years, including the first rotary telephone and the first lawnmower to be seen in British Columbia. The PNE fair was also the origin of other well known Vancouver Events, such as the Vancouver Boat Show and the BC Home Show. 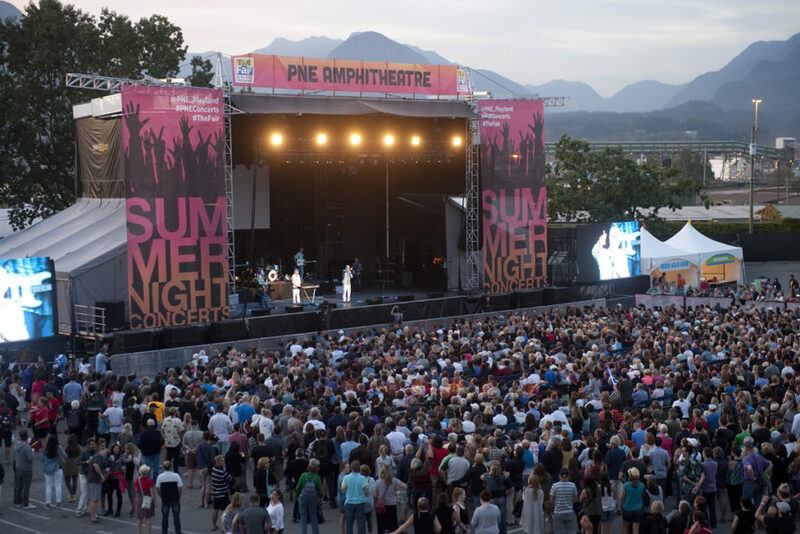 This year’s PNE runs from August 18 — September 3, 2018. The PNE fair has gone from strength to strength over the years and now attracts almost 1-million visitors every year. It stays true to its trade show route, and exhibits the latest developments in technology and showcases local agriculture. Various species of livestock are on display, and there’s an annual Pacific Spirit Horse Show. The fair also plays host to and promotes locally made products, and has a marketplace with over 150 stalls. Entertainment is now a large part of the fair, with the focus more towards a fun family day out. Playland is still open not only during the fair but for the whole summer season from April through to September. There’s also an arcade and an extensive list of funfair game booths. Live entertainment is an integral part of the event, with everything on show including music, comedy, dog agility, and jousting knights. The Pacific National Exhibition has expanded and changed extensively over the years. However, it still stays true to its origins of showcasing innovation while providing a fun day out for the family. The venue may have been developed since the first fair back in 1910 but the PNE fair hasn’t moved for over 100 years, and it has no plans to stop any time soon.